Good quality wigs need good care also. We offering a high-quality Hair Wig Accessories for men Hair Wigs and women hair wigs. You have to choose Hair Wig Accessories for the long life of your wigs after wearing a wig, so don’t worry!. After you select your wig, there are many Hair Wig Accessories. You can buy to make wearing your wig more relaxed. To let for proper wig care, so you can protract the life of your new wig. Our accessories are used for removing and attaching hair systems. A C-22 solvent is best for removal of hair patch or hair system. 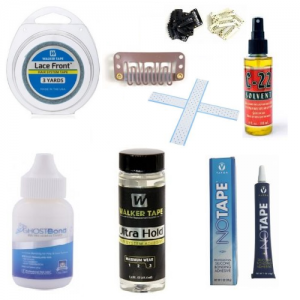 An Ultra-hold adhesive is the best adhesive for attaching hair patch or system. Delhihairloss also provides customization of our product range as per the specifications if the clients. We check the quality of these toupees at various structures before the last dispatch. We offer our customer’s a number of high-quality Hair Wigs Accessories like Hair Patch Clips, Scalp Protector, Vapon No-Tape, Scalp Protector, Ultra hold Glue, no-shine tape, C-22 Solvents, ghost bond and front lace tape. Walker Tape Company is making all Hair Wigs Accessories. Our product made by Walker Tape Company. It is very reputable company and approved by FDA. Our Hair Wig Accessories designed and prepared by the experts of the Walker Tape Company. These accessories are safe to use and finest in quality. Hair Wig Accessories are specially designed. It is For the safety of natural hair and scalp. Our accessory is durable and strong attachment, and easy to wear and remove the wig from the painless. Also, we can provide wig accessories to your need or your demand. Using our these Hair Wig Accessories, you can raise the permanency of your wig. We have tape, glue and all types of accessories for all types of skin like sensitive skin, oily skin, dry skin.